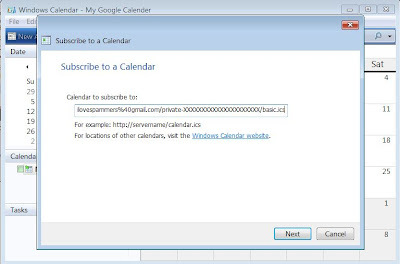 This is a quick recipe on how to get your Google Calendar to show up in Windows Calendar in Vista. You won’t be able to make changes to the calender however you can set update interval to automatically update it via the Google Calendar webpage. Nice for when you need your Google Calendar offline on a laptop/tablet pc. 1. 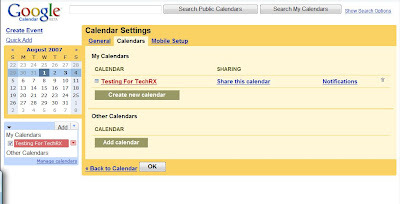 Login to your Google Calendar in your web browser. Then click on the Settings link in the upper right. 2. Now, go to the bottom of the Calendar Details tab and under the “Private Address” area, click on the ICAL button. Once you do, you will get a pop-up w/a URL to a .ics file. Right-click on the link and choose Copy. You can click OK to the popup. 3. Open up Windows Calendar in the Vista Start Menu. 4. Go to Tools > Subscribe. You will then get a dialog box asking for the url of the web calendar to subscribe to. Right-click in the box and paste the url (or hit CTRL+V) and hit Next. 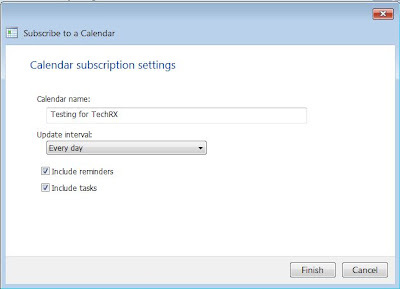 After it connects and subscribes, you will see a dialog box that you can enter in the name of the calendar, the update interval and whether to also receive reminders and tasks and then hit Finish. 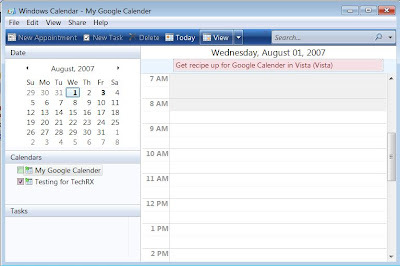 You should now see your google calendar in Vista’s Windows Calendar. It should automatically update at the interval set when we subscribed. You can change this by: going to View > Details Pane (will give you interval options in the details pane when you click on the calendar). NOTE: you CANNOT add calendar items to your Google Calendar with Windows Calendar since we are only subscribed to the web calendar, you will need to add appointments/meetings/tasks via the Google Calendar webpage.